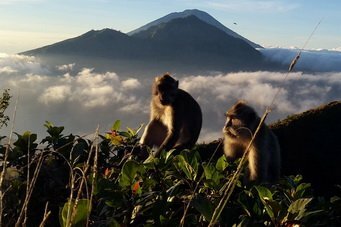 This trek could quite easily become the highlight of your trip to Bali. Your personal, English-speaking guides are licensed, local and experienced – all with 5-star ratings. We are unwaveringly committed to both your enjoyment and safety. Book your spot now. Enjoy a moderate trek up the volcano to witness the spectacular sunrise view while your friendly, English-speaking guides prepare your breakfast over the volcanic steam. With 5-star ratings in Trip Advisor, your guides are licensed and local, having climbed this mountain thousands of times. We believe the only thing more important than your enjoyment is your safety. Pack your swim suit for the soothing bath in Batur’s natural hot springs immediately following the trek. 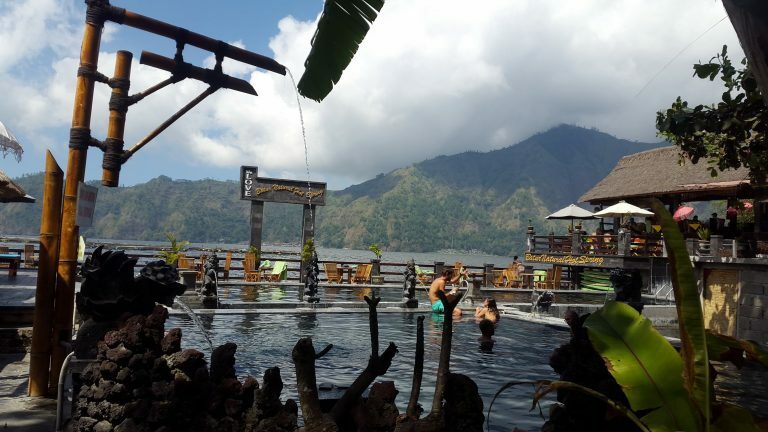 Let your muscles loosen and your mind wonder as you enjoy even more fantastic views while floating in the therapeutic pools at Batur Village. A visit to a coffee plantation to taste local coffee and teas awaits before your return to your hotel. You’ll get back in time to wind down at your hotel pool or lounge at the beach. NOTE: Guests routinely rate this trek as the highlight of their visit to Bali. We urge you to book your personal trek and guide while space is available. Your friendly, English-speaking driver will pick you up from your hotel and will take you directly to the base of the volcano. There you’ll meet your friendly English-speaking guide who will give you a brief overview of the trek and will answer any questions you have. Mount Batur is part of the UNESCO Global Geopark Network and an active volcano. You’ll begin your ascent bright and early under a blanket of stars. Your guide will be happy to discuss the landscape, history and culture of the area. Arriving at the summit, your guide will be happy to offer the best vantage point for photos and will assist you in getting the best shot. Or, if you’d like to just sit and enjoy the view in peace, we encourage you to do that as well. At the top, you’ll be given a meal and beverages to help regain your energy for the trek around the crater and back down the mountain. We will begin our descent back to Toya Bungkah where we will enjoy the soothing and therapeutic waters of the natural hot springs. At 38 degrees celsius (about 99 degrees fahrenheit), it’s a perfect way to relax after an early morning hike through the spectacular countryside of northern Bali. We’ll then board the bus and make one final stop before we reach your hotel. We’ll visit a coffee plantation where you can sample different coffees and teas native to Bali and Indonesia – one last “pick-me-up” before you end your adventure. 03.45 AM: Arrival at the starting point of Toya Bungkah village. 09.00 AM: Arrival at Toya Bungkah village. Continue to Batur Hot Springs. 12..00 PM: Head back to your hotel. 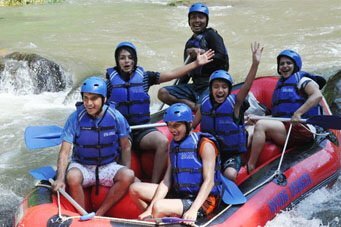 US $75.00 per person (minimum 2 people per group). Both the park and the hot springs charge entrance fees, but these are already included in your package. Regardless, we advise bringing extra money for shopping and souvenirs. Additionally, because our tours are very limited, we require 50% additional fee for those traveling alone. We apologize for any inconvenience this may cause. Our guides always appreciate tips if you are satisfied with their services, but it is not required. We appreciate your business either way. We try to accommodate your cancellation requests as best we can, but please note that the fee is nonrefundable if you cancel on the day of or day prior to your trek.This is because we have made other commitments and schedule arrangements that cannot not be changed. We apologize for any inconvenience this may cause. You may bring a new change of clothes after the hot springs. We understand that accidents happen and injuries sometimes occur. That is why our guides are trained in first aid and rescue procedures. Should an accident occur, our guides will notify a mountain rescue team immediately if evacuation is required. We will also notify your next of kin and help you get the medical attention you need. Our guides are experienced and knowledgeable, knowing the hazards and risks with each climb as well as the limitations of some of our guests. For your safety we will always err on the side of caution. 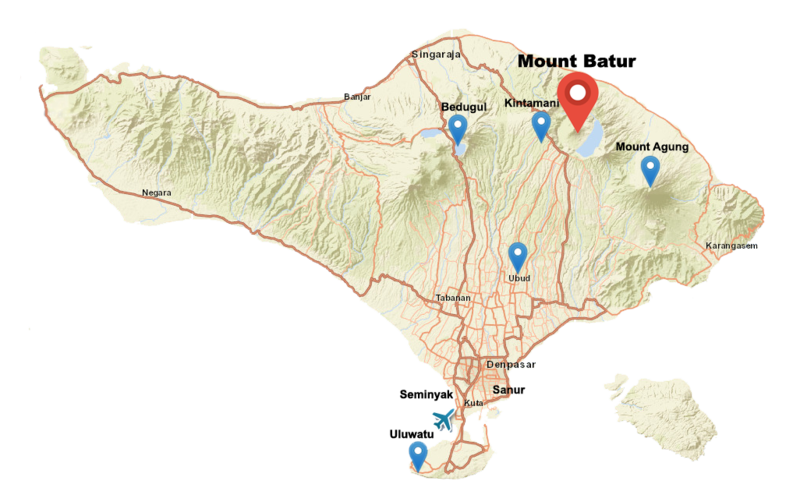 Additionally, all our drives carry valid driver’s licenses and are experienced on the challenging roads of Bali. They practice caution at all times. Weather conditions can be tricky in the higher elevations of Bali and unfortunately, we can never predict clouds or sunshine. On some days, the clouds may block the sunrise over the ocean, but we guarantee, the view will still be amazing. Guests who have made this trek on cloudy days overwhelmingly agree that the trek was still well worth it. the countryside and view remains spectacular, regardless of weather conditions. Yes. 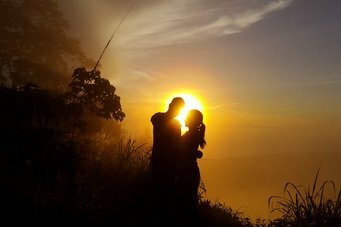 You will notice that most of the negative comments guests have of Mount Batur are those who tried to climb the volcano without a guide. It is legal to pay the entrance fee and climb the volcano on your own, but we do not advise this as the locals can become quite protective of the mountain. If you do not choose to climb with Bali Trekking Exploration, we advise you choose another licensed and experienced guide operator. Yes. 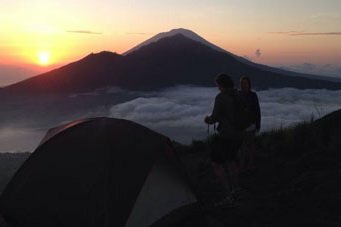 Camping is a fun way to experience Mount Batur and we have a trek specifically for those who want to camp. 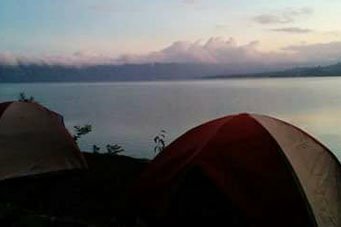 The only experience better than climbing to this spectacular sunrise is waking up to it in the morning. Go here to learn more about our camping package………………..
Will the water in the hot springs make me sick? No. There are no health hazards associated with the hot springs, but if you have a medical condition which may be affected by the minerals in the natural springs, please exercise good judgement while bathing. We advise that you check with your doctor first. Under no circumstances, do not drink the water under any circumstances. Yes, but with adult supervision only. Please watch your children at all times. Please see our safety policy above. If you get hurt, our guides are trained to assess the situation and if you need to get evacuated, we will notify the mountain rescue team immediately. Your best of kin will be notified and we help to take care of any other details to insure your safe return to your hotel. 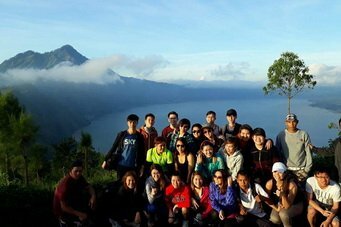 It is likely there may be other groups trekking Mount Batur and bathing in the hot springs the same time as you. Our guides have been climbing this volcano for over eleven years and know all the trails and viewing points that have the fewest crowds and best scenery. We do not recommend any mountain trekking for those who have a serious fear of high places. If your fear is moderate and controllable, our guides will help ease you along and take you through the areas where you are most comfortable. 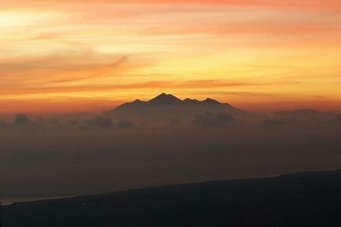 Please consider that Mount Batur is 1717 meters above sea level.